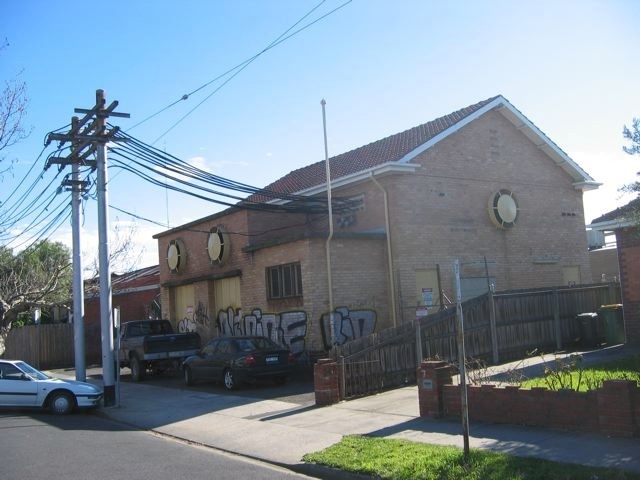 The electrical substation at 7 Martin Street, Thornbury, erected by the Melbourne and Metropolitan Tramways Board in 1955 is significant. It was a key part of the program to electrify the former cable tram route along High Street. The feeder cables were fed from the substation to the trolley wire system, supplying power for the new East Preston tramway. Initially the substation had one 600 kilowatt rectifier installed. Another 600 kilowatt rectifier was soon added. The Northcote substation was one of three new substations built by the MMTB in 1955, the others being at Fitzroy and Clifton Hill, which supplied power for a new tram service to East Brunswick as well as the East Preston service. It is still in use today. The building is built of cream brick, with a darker brick used on its base. The rear section of the building has a transverse gable roof, and there is a lower section projecting towards Martin Street. This projecting bay has two flat roofs at different levels, producing a stepped effect. The projecting bay has two large doorways facing Martin Street, with concrete hoods above them. The portion with the lower roof has fenestration. Above each of the doors are the steel covers of fans, or a similar ventilation system. The east elevation also has one of these ventilation elements. The building's west elevation has a tall wall opening with a hoist for the fitting and removal of electrical equipment. Later alterations and additions and other buildings on the site are not significant. The electrical substation at 7 Martin Street, Thornbury is of local historic significance to Darebin City. An electrical substation erected by the former MMTB. The building is built of cream brick, with a darker brick used on its base. The rear section of the building has a transverse gable roof, and there is a lower section projecting towards Martin Street. This projecting bay has two flat roofs at different levels, producing a stepped effect. The projecting bay has two large doorways facing Martin Street, with concrete hoods above them. The portion with the lower roof has fenestration. Above each of the doors are the steel covers of fans, or a similar ventilation system. The east elevation also has one of these ventilation elements. The building's west elevation has a tall wall opening with a hoist for the fitting and removal of electrical equipment.